The beginning of the school year can be very hectic. This school year has been just that. We can back in the middle of August and greeted our returning and new students. I worked on the media center (library, whatever you want to call it) and prepared for the school year. I began seeing classes and I was thrilled to see how well all of the classes behaved. I started using some new incentives this year, because a group from last year was not well behaved. For the K-2 students I began using The Golden Shelf Elf Award. This has been one of the best years I have ever had! Each class wants to win The Golden Shelf Award! What is this exactly? 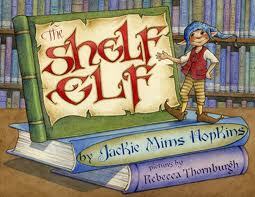 There is a book, "The Shelf Elf", by Jackie Mims Hopkins, that I purchased over the summer. It is a story about an elf (Skoob) that goes to live in the library and helps take care of all of the books and shelves. Skoob wants to have the best library so he can win The Golden Shelf Elf Award, from the Grand Dewey Daddy shelf elf. The book discusses proper book care and library procedures. So I read some information from Upstart, the company that published the book and they had resources available on how to use the book in the library. I informed my students that, over the summer, we had a library shelf elf come to live in the library. His name is Rustig, he is from Holland, and his name means "quiet" in English. He is here to help take care of the library shelves and to make sure that all classes behave and follow the library rules. 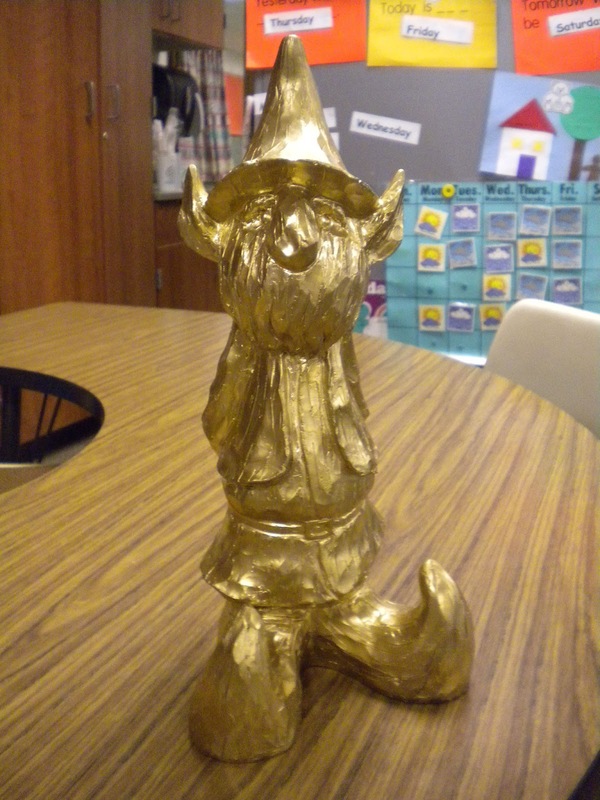 I used one of the ideas listed and created an incentive program for the students to earn The Golden Shelf Elf Award for their classroom. Each class has a marble jar and receives marbles for good behavior, returning library books in good condition, perfect shelves, sitting quietly, etc. At the end of each month, whichever class has the most marbles in their jar, gets to display the award for one month. The excitement from the students AND teachers was unreal and they are fighting hard to win the award. It is very prestigious! I was not happy with the way that our book fair ended, in the fall. We had very low sales and did not raise much money for the media center. Hopefully, the spring will be a success! These months were hectic with lots of great lessons! Grades K-2 completed author studies and grade 3-5 completed a lot of library lessons. That is all for now, but check back soon, because I hope to keep more up-to-date and create resources to share!